This book brings together both theoretical and empirical research directed toward the role of strategies in deductive reasoning. It offers the first systematic attempt to discuss the role of strategies for deductive reasoning. The empirical chapters correspond well with the main issues in the study of deduction, namely propositional reasoning, spatial reasoning, and syllogistic reasoning. In addition, several chapters present a theoretical analysis of deduction, related to the concept strategy. The book also presents data about the role of strategies for statistical and social reasoning. This book will be of interest to researchers and students of cognitive psychology. It will also be of value to people working in Artificial Intelligence, because it highlights results on how humans use strategies while tackling deductive puzzles. Contents: Preface. J.St.B.T. Evans, What Could and Could Not Be a Strategy in Reasoning. M.J. Roberts, Individual Differences in Reasoning Strategies: A Problem to Solve or an Opportunity to Seize? J.A.G. Madruga, S. Moreno, N. Carriedo, F. Gutiérrez, Task, Premise Order, and Strategies in Rip's Conjunction-Disjunction and Conditionals Problems. M. Dekeyser, W. Schroyens, W. Schaeken, O. Spittaels, G. d'Ydewalle, Preferred Premise Order in Propositional Reasoning: Semantic Informativeness and Co-Reference. R.M.J. Byrne, O. Espino, C. Santamaria, Counterexample Availability. K.I. Manktelow, N. Fairley, S.G. Kilparick, D.E. Over, Pragmatics and Strategies for Practical Reasoning. T.C. Ormerod, Mechanisms and Strategies for Rephrasing. M. Gattis, C. Dupeyrat, Spatial Strategies in Reasoning. R. Rauh, Strategies of Constructing Preferred Mental Models in Spatial Relational Inference. A. Vandierendonck, G. De Vooght, C. Desimpelaere, V. Dierckx, Model Construction and Elaboration in Spatial Linear Syllogisms. P.N. Johnson-Laird, F. Savary, M. Bucciarelli, Strategies and Tactics in Reasoning. S.J. Handley, I. Dennis, J.St.B.T. Evans, A. Capon, Individual Differences and the Search for Counterexamples in Syllogistic Reasoning. V. Girotto, M. Gonzalez, Strategies and Models in Statistical Reasoning. M.G. Devetag, P. Legrenzi, M. Warglien, Focusing Strategies in Reasoning About Games. 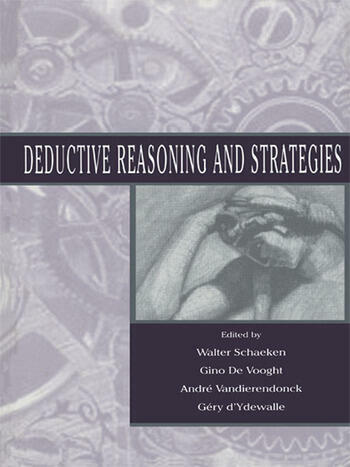 W. Schaeken, G. De Vooght, A. Vandierendonck, G. d'Ydewalle, Strategies and Tactics in Deductive Reasoning. "Strategies, however, have been overlooked in some studies of deductive reasoning. This is one reason why the book Deductive Reasoning and Strategies is appealing--it emphasizes the importance of focusing in on strategies and their role in human reasoning....Deductive Reasoning and Strategies presents a new perspective that will lead to a broader view, and, ultimately, a greater understanding of how reasoning occurs."